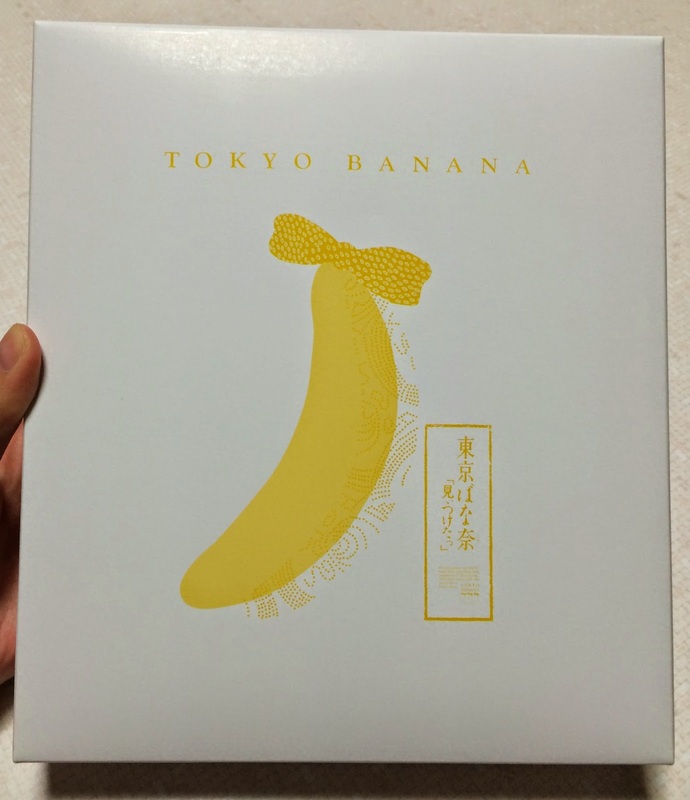 My husband visited me while I'm back in Toyama, and he bought a box of new flavor of "Tokyo Banana." 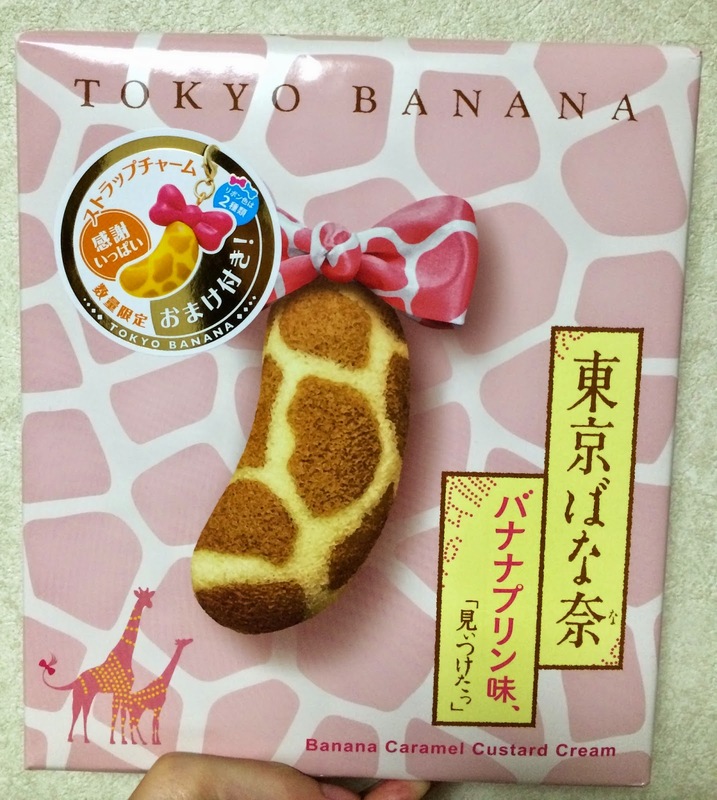 Tokyo Banana (東京ばな奈) is a famous souvenir of Tokyo manufactured and sold by Grapestone Co., Ltd., which also handles Nenrinya (a baumkuchen brand). 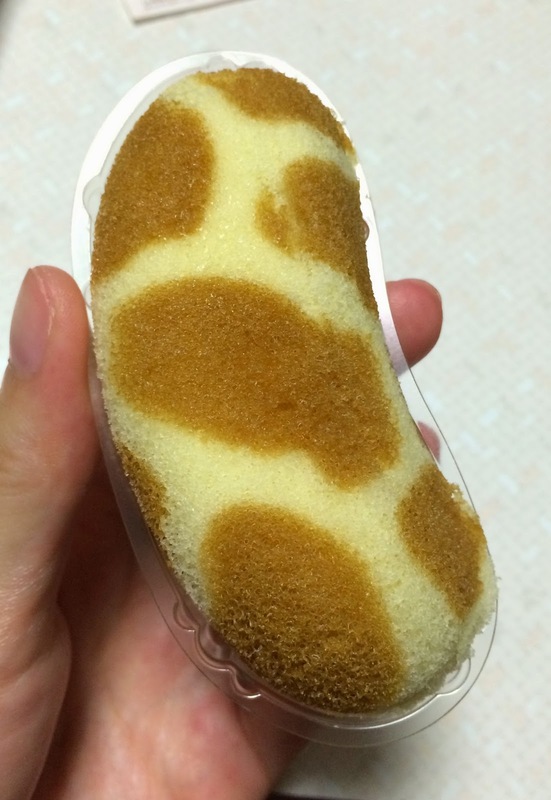 Tokyo Banana is a tiny banana-shaped sponge cake with banana puree. Other Grapestone Co., Ltd. products I reviewed. The new flavor my husband bought was "Banana Caramel Custard Cream" that is written "Banana Pudding Flavor" in Japanese on the box. The wrapping paper is a pink and yellow-orange giraffe pattern with 2 pink giraffes on the left corner. Underneath the wrapping paper, the paper box was a simple box. 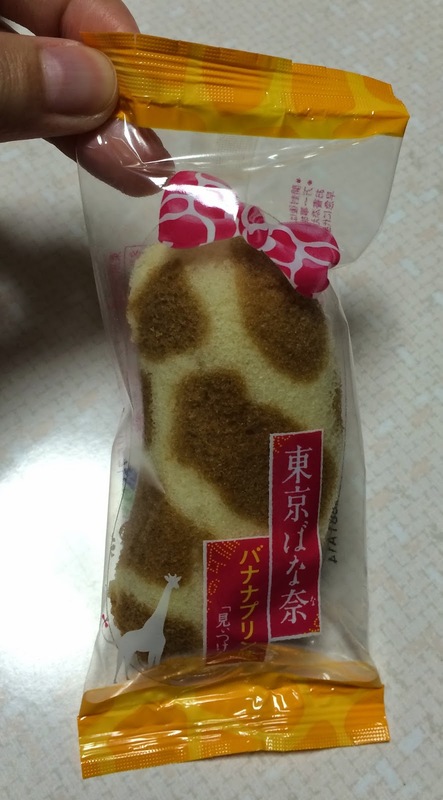 The Tokyo Banana inside has the same giraffe pattern. This Banana Caramel Custard Cream was launched on August 22, 2012, so not really new yet new to me. 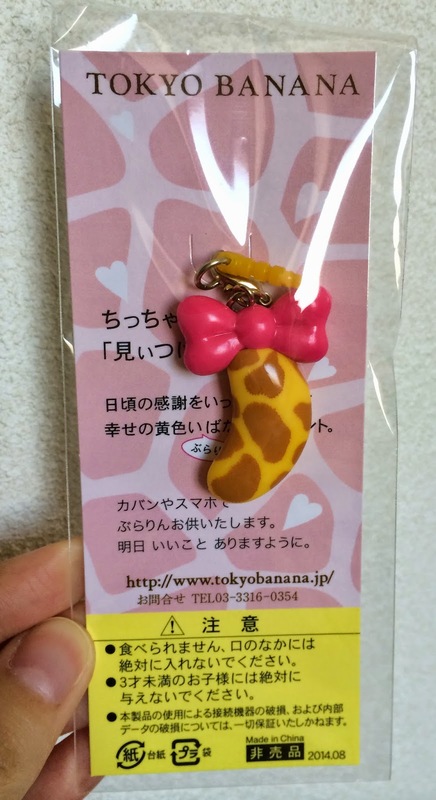 They started a campaign on September 1, 2014 with which keychain of a miniature of giraffe Tokyo Banana comes with the confectionery. The ribbon has 2 colors (pink or blue) that isn't selectable, and I got a cute vivid pink keychain this time. * This campaign is as long as the supplies last. 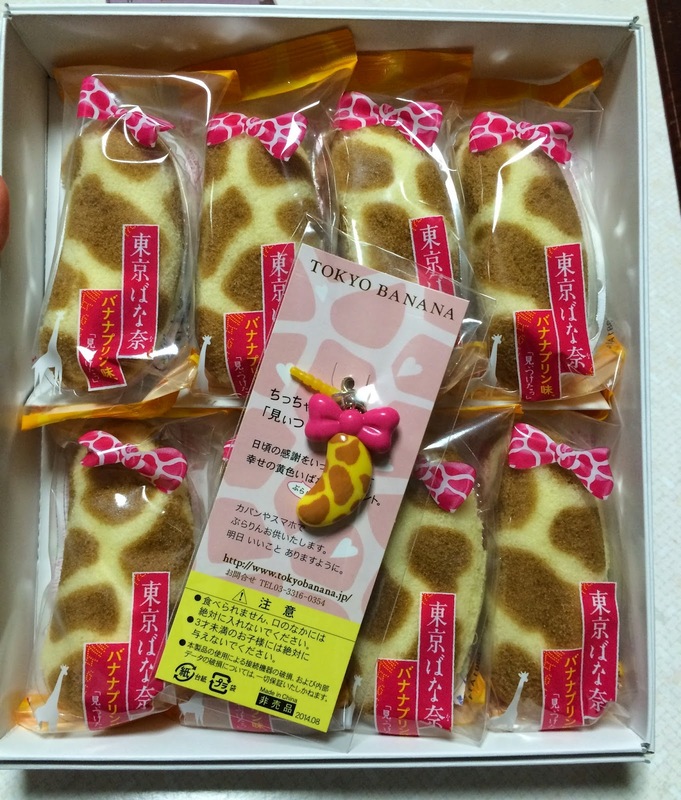 Each package has yellow and orange giraffe (I think) pattern on the top and bottom, and giraffe patterned pink ribbon was printed on so that it looks like the Tokyo Banana was wearing a ribbon like the wrapping paper. At the left bottom, there's a shadow of giraffe in white. It really was giraffe patterned. As always, the sponge cake was very soft and moist. The brown part is made with cocoa powder. The filling inside was sweet, smooth, rich and slightly bitter like burned caramel or caramelized sugar on creme brulee. It's very cute and a tasty snack with a keychain. This flavor is available at Daimaru Tokyo (both B1 and 1st floor), Haneda Airport (Terminal 1, 2 and Intl. airport) and Narita Airport (Terminal 1 and 2). 1 piece contains about 102kcal.